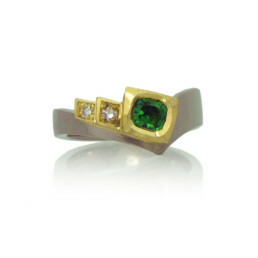 A cushion cut green Tsavorite and two diamonds set in 18k yellow and white gold. Amanda worked closely with her client to create this unique engagement ring from scratch using three beautiful gemstones he recently inherited. 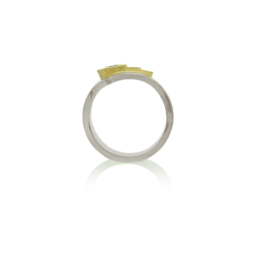 Inspiration for the ring came from the recipient’s affinities for irregular geometries, intricate detail and strong, smooth lines. 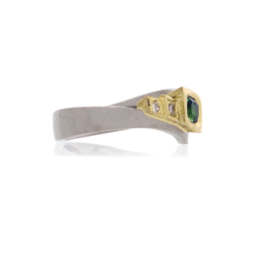 The result is an asymmetrical V-shaped band in which to hold the three gemstones. The rectangular stone settings nestle themselves in descending size to sit comfortably within the band’s V-design. 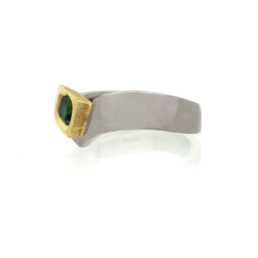 The band itself is mirror polished, as well as the top of the stone settings. The side of the settings have delicately hand engraved lines, which radiate out from the inner circumference of the ring.